So I have this friend who recently got fixated on me making him scones. Scones, kind of random, but I'm always happy to feed someone's sweet tooth when it gives me a chance to bake. Baking for others is my favorite kind of baking. 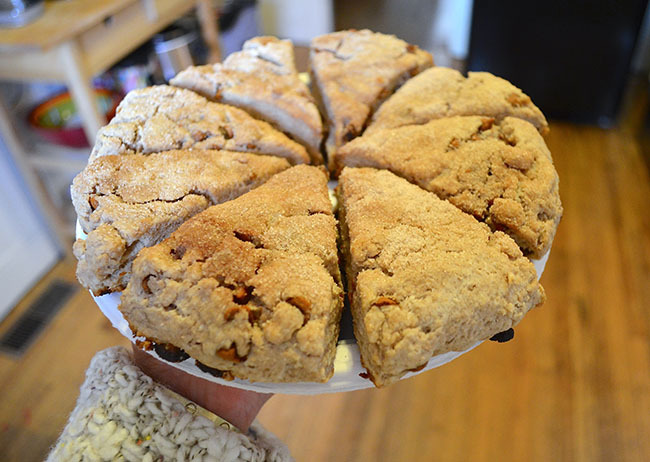 After a few weeks of pestering me for scones, I finally stopped the begging and made these Double Cinnamon scones! They are studded with cinnamon chips and garnished with cinnamon sugar on top! 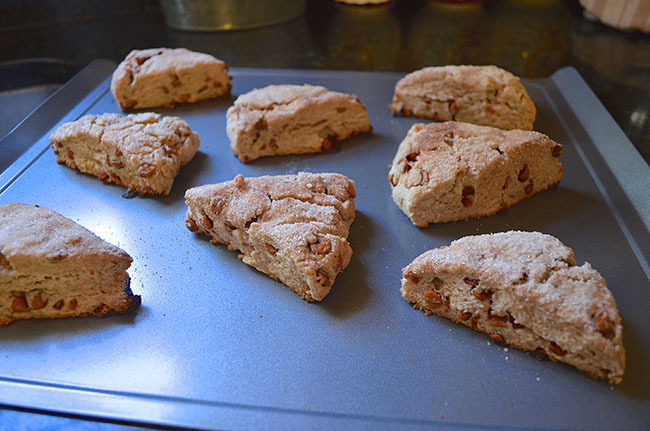 I used this trusty simple scone recipe and then added my additions! I didn't have a pastry cutter, but I used the best kitchen tool I own-clean hands, to crumble the mixture together. Slightly sweet but really buttery makes for the perfect scones! Preheat your oven to 425 degrees. Put flour, baking powder and salt in a large bowl, stir to mix. Add cut up butter to the bowl. 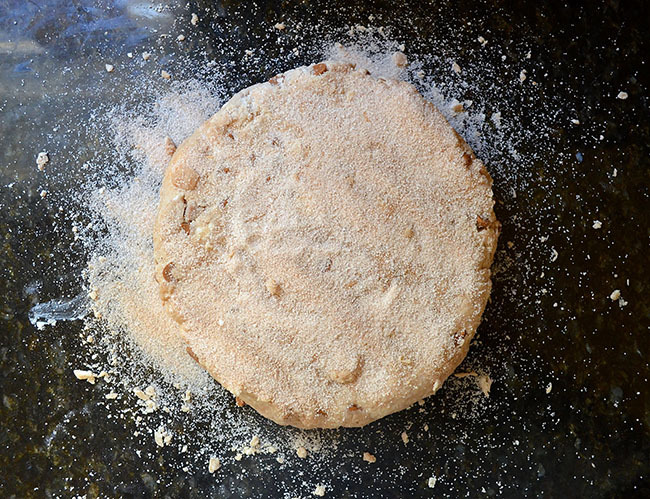 Using a pastry cutter or your hands, combine the mixture until it is in fine granuals. 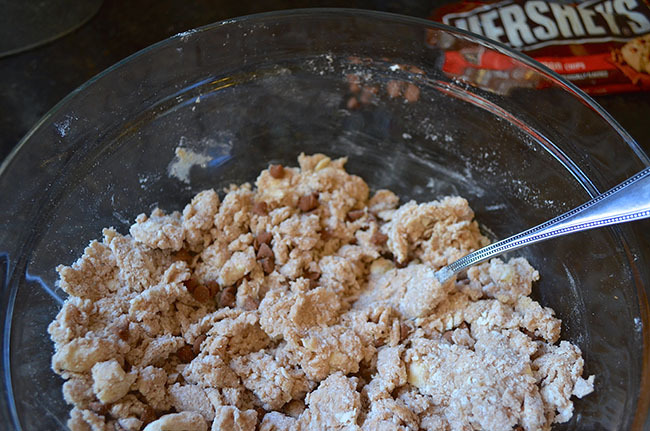 Add sugar, cinnamon, and cinnamon chips; toss to mix. Add milk and stir with a fork until dough forms. It will be very crumbly. Turn dough onto a clean surface and form into a ball. Pat or roll into a flat circle about 3/4-1 inch thick. Mix together about 1/4 cup of sugar and 1/2 teaspoon of cinnamon. Sprinkle the mixture over the top of the dough. Cut into 8 wedges. 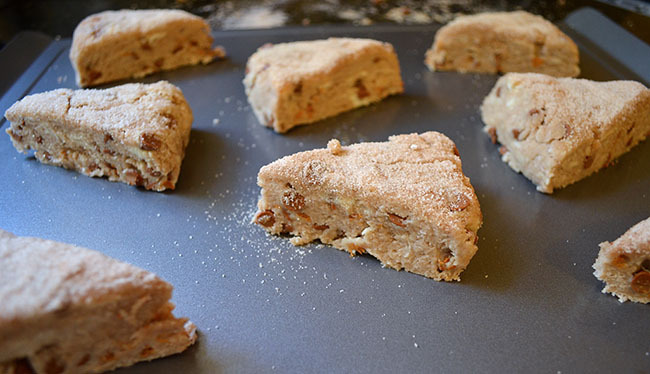 Place on an ungreased cookie sheet and cook for 12 minutes or until edges are just browning. ...and here is what it looks like zoomed out. I love our kitchen, but the black countertops and faulty lighting has me resorting to balancing things on the corner of the sink to get the small amount of natural light that comes in from the window. Oh the joys of a rent house and faking I know how to take pictures. If I'm being honest, I think this is the first time I've ever successfully made scones. The few times I have they are usually too dry and crumbly or too soft and muffin like. This recipe is trusty and can easily be adapted for another flavors. Sub for chocolate chips or maybe orange zest and dried cranberries?